Our language arts class has started a poetry unit. We have discussed various components of poetry (stanzas, alliteration, repetition, etc.) as well as started writing our own poems. Students started with writing a narrative poem. We will be continuing our poetry unit during language arts class. However, I introduced two fun poetry websites that allow students to explore the world of poetry. I have included the links below. The students loved our pajama day! 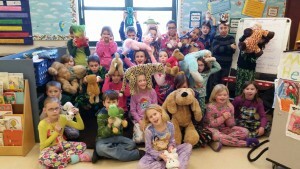 We were all very comfy at school today and had fun showing off our stuffed animals. I have already had a few students ask if we can have another pajama day this year. I hope that everyone has a fantastic weekend! That’s right, our February Star Reward is a comfy, pajama day! Star Students- Wear your favorite pajamas and bring slippers to change into at school! 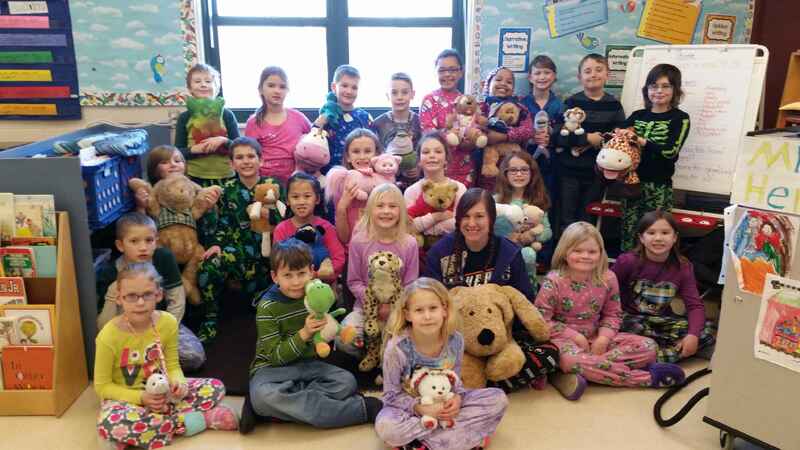 Rock Star Students- Wear your favorite pajamas, bring slippers to change into at school and bring one stuffed animal or pillow pet! What’s happening in room 107? Don’t forget our Book Character Dress-Up Day is Monday, March 2nd! Second grade would like to participate in Dr. Seuss’ Read Across America Day by dressing up as our favorite book character. If your child would like to participate, they can dress up as a character from their favorite book. Each student will be given the opportunity to share about their costume and their book, so please send the book in with your child. If you do not own the book, your child can check it out from the library. Each costume must be school appropriate and may not include weapons or face paint. STAR Party- Our STAR behavior reward will be this Friday, Feb. 27th. We will be sending home more information about the rewards on Wednesday. I will also post the information on my blog. Stay tuned! Spaghetti Dinner Basket-We are still collecting items for our “Rainy Day Basket” for the PTO spaghetti dinner. You can bring in items until Friday. Fun Friday Science- The students have been doing a fantastic job during specials and have been receiving excellent reports. I have purchased a fun science experiment that a student had shared with the class. We are currently waiting for it to ship to us! The students have been learning about the difference between the main idea and the theme of a story. We have also been discussing the sequence of events and how we can use the sequence of a story to help us summarize. We will continue to work with prefixes and suffixes and how they can change the meaning of a word. One of the report card skills that we are currently working on is using context clues to determine the meaning of unknown words. We have also started poetry. The students learned a lot of poetry vocabulary and are currently working on creating their own narrative poems. In writing, students will continue to get used to the OOTTS organizer. We will also be publishing work on Microsoft Word and Little Bird Tales. Students should continue to read at least 10 minutes each night. If they are assigned a chapter of their chapter book for reading group, this can count towards their reading time. Students can also go on Kidbiz at home! Kidbiz allows students to read non-fiction articles on current events and answer comprehension questions about the article. We will be completing our fourth unit in the next few weeks. Our fourth unit included two and three digit addition and subtraction as well as multi-step number stories. We are currently beginning to work on multi-step number stories. In multi-step number stories, students are required to solve more than one problem in order to get the answer to the word problem. Multi-step word problems require students to use reasoning and critical thinking skills to determine how each problem needs to be solved. Ex: Chris had 28 baseballs and Mike had 24 baseballs. They were playing catch and lost 6 baseballs. How many baseballs do they have left? Students would need to find out how many baseballs Chris and Mike have altogether and then subtract 6 from the number. Ex: Sarah made 36 cookies and Doug made 24 cookies for a bake sale. They need to have a total of 60 cookies. How many more cookies do they need to bake? Students would add 36+24 to see how many cookies they have in all. Then, students would subtract their sum from 60. Please refer back to the study guide for more examples of this kind of problem. Xtra Math- Students who use the Xtra Math website 2 or more times a week will be given a Brecknock Buck. Students will also receive a prize for mastering addition, subtraction, multiplication and division. Please do not hesitate to contact me with any questions or comments. My e-mail address is lacey_henn@elanco.org.